We all love to have egg masala or egg curry for a healthy breakfast side dish . Most of us will be searching for simple breakfast egg recipes, but this time lets have a main course egg recipe for breakfast. I made this egg gravy for my dinner and served along with chappathi. 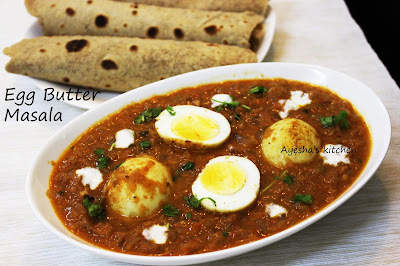 I have been thinking of making this egg makhani for quite a long time. Each time i will end up with some other egg recipes or with paneer makhani recipe instead. Finally i made this hard boiled eggs in butter masala gravy recipe last week and is best to enjoy with Indian breads. Here toasted boiled eggs are added to the butter masala gravy made using onion, tomato puree, fresh cream and other spices. Hope you all will try this recipe and drop your valuable feedback. 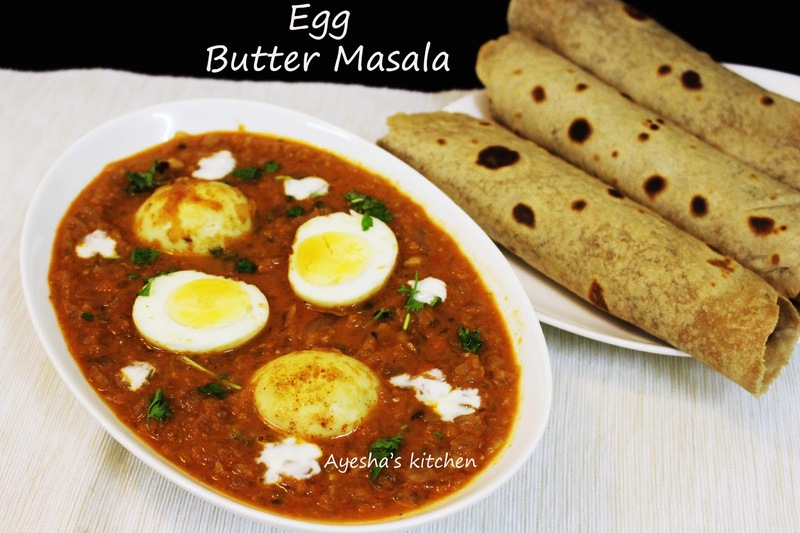 Lets see how to make egg butter masala recipe / egg makhani / simple egg recipes. Enjoy. Boil the tomatoes with skin until it is well cooked. When done, peel the skin and puree it to a fine paste and set aside. Boil eggs in a vessel with enough water and cook until it is cooked well. Peel its skin. Heat a pan with half tsp of butter, toast the peeled egg until it goes golden. Set aside. (you can sprinkle some spice powders while toasting the eggs). Now heat butter in a non stick vessel. Add cumin seeds and bay leaf. Then add finely chopped onion and saute until it become transparent. When done, add ginger garlic paste and green chilies. Saute until raw smell disappears. To this, add tomato puree and cook for few minutes. When the gravy is done, add kashmir chili powder, coriander powder and salt. Mix well and let it cook for few minutes. (can add half a cup of water if required). Now add the fresh cream and give a fine mix. Check for salt. Add the toasted egg into the butter masala and sprinkle crushed kasuri methi over it. Garnish with chopped coriander leaves.